The female reproductive system is more complex than you might think. In this article, we'll discuss the relationship between menstrual cycles and conception. Menstrual cycles and conception are directly related. To do any fertility test on a woman, you need to know how her menstrual cycles work. All the internal and external changes that occur during each period are determined at conception. Therefore, it’s important to know how ovulation works in a woman’s body. Remember, ovulation is the process by which the female body releases an egg. Reproduction occurs when sperm fertilizes the egg. 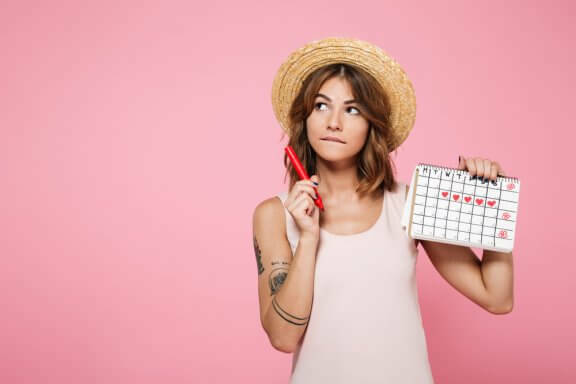 In this article, you’ll learn interesting facts that you might not have known about ovulation, menstrual cycles, and fertility. Why is there a relationship between menstrual cycles and conception? In addition to the day ovulation occurs, fertility also increases in the 2 or 3 days leading up to it. If you want to conceive, keep these dates in mind. Remember, sperm will remain in the female body for over 24 hours. During ovulation, her lips look more attractive, her skin is softer, her voice is sweeter and her pupils dilate. The life of the egg is very short. Once it leaves the ovary and goes into the woman’s body, it only lives for 4 to 12 hours. If you want to conceive, you need to take this time into account. It’ll make it easier for the sperm and egg to join. You can recognize that you’re ovulating by changes in your behavior. During these days, the woman’s body prepares to reproduce. She will seem extra feminine. Ovulation triggers her sense of smell. During her menstrual cycle, there are days when the woman’s sense of smell sharpens. It’ll be much easier to sense male hormones. Also, a man’s particular smell can also be very attractive. Every woman is born with millions of immature eggs in her ovaries called oocytes. During adolescence, half of these oocytes are absorbed by the ovaries. This will be the amount that is released over the course of your reproductive life. STD‘s that aren’t treated properly can cause infertility. This happens in both men and women. Symptoms and menstrual pains are stronger in the winter. Blood flow, pain intensity and duration of bleeding tend to be more severe because of the cold. During menstruation, you can have certain behaviors that are more common in men. Estrogen levels decrease because of your period. This can cause some “masculine cognitive abilities” to become more apparent. Periods can lead to iron deficiency. Blood loss also means that a good amount of iron is lost. One symptom of this deficiency is constantly feeling fatigued. Your body needs a little fat to menstruate regularly. If your body fat levels are less than 8%, your menstrual cycle tends to decrease or disappear. Fat cells are related to estrogen levels. That’s the hormone your body needs to menstruate and conceive. Did you already know all of this data about your period and how it influences your ability to conceive? A woman’s body is much more complex than you may have thought! Now that you know, you can benefit from the link between your menstrual cycles and conception. If you want to be a mother, don’t hesitate to put them into practice.